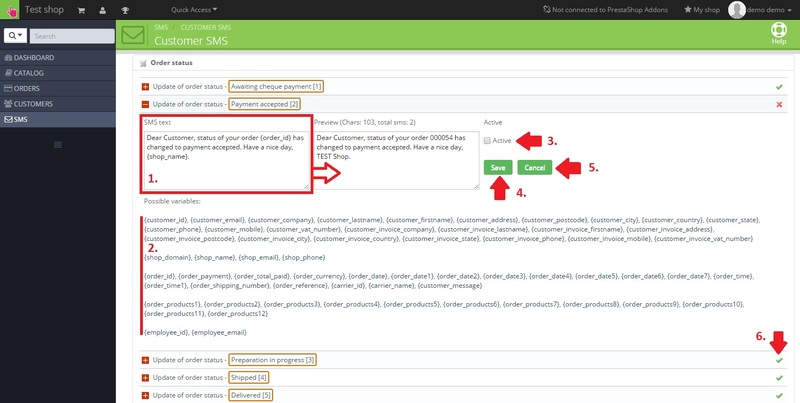 Move the mouse over the SMS tab in the PrestaShop main menu and choose Customer SMS. In particular tabs you can see language mutations for all languages used in your web store. First there is choosen language mutation for main language of the web store. For example if the store is translated into english and spanish than in Customer SMS tab are displayed english and spanish language mutations. If customer makes an order in english, than he receives SMS in english. If customer makes an order in spanish, than he receives SMS in spanish. If you wish to use diacritic or non-latin languagues like chinese, arabic, greek, etc., check Unicode and confirm by clicking on Save. Otherwise, the characters with diacritic won´t be displayed correctly. Click on the event you wish to setup. 1. Edit SMS text. You can see a live preview in the adjacent field. 2. You can dynamically add various entries from the database using preset parameters. Simply select the desired parameter using your mouse and copy & paste into your SMS text. 3. Activate automated SMS sending for the selected event by checking Active. 4. Confirm changes by clicking on Save. 5. Pressing the Cancel button reverts it back to its original state, whithout saving changes. 6. Active events are marked green.